After centuries of understanding war according to its Clausewitzean definition i.e. pitting states against states for a definable political end – thus leaving all non-state actors outside the scope of war – the decolonization wars, and more so even the end of the Cold War, brought in their wake a significant change in the reading of political violence. “Old” interstate conventional wars seemingly gave way overnight to the “new” wars, described by Mary Kaldor, a leading academic on the changing nature of warfare, as a blend of organized crime and massive violations of human rights. Following this drastic cursor change regarding the study of war and its belligerents, underaged combatants made their appearance under the spotlight. The domain of war was not to be seen by scholars as exclusively reserved to adults anymore and as a result, literature on child soldiering began to burgeon. Concomitantly, the turn of the century was also to witness an increase of the Canadian military implication and visibility on the international scene, with notably our interventions in Somalia, Rwanda, Bosnia and more recently in Afghanistan to name a few. This unfortunate reality was to give me the opportunity to reconcile my two main academic areas of interests: child soldiering and modern Canadian military history and policy. It was thus quickly finally decided upon: my master’s research was to assess the readiness of the Canadian Forces (CF) to confront child soldiers on the battlefield. Its aim would be to improve the CF’s practice regarding this matter while ensuring that Canada respects its treaty obligations. Although child soldiers are not a completely new phenomenon, many specialized organizations report that, in spite of efforts to the contrary, children are playing an increasingly active role on the battlefield. So widespread is the use of children fighting in armed hostilities that foremost authorities on child soldiering have even begun to speak about this reality as a doctrine of war, making the decision by armed groups worldwide to employ underage combatants nothing less than a “deliberate and systematic choice”. As articulated by L.Gen Romeo Dallaire (Ret’d), “despite the diplomatic conventions and protocols we were passing and signing and ratifying, this new weapon of war had snuck into the inventory of conflicts around the world”. As such, the presence of children on the battlefield, particularly acute in weak or failed states plagued with intra-state wars, remains an inescapable reality.Since these are the dominant operating environments where the CF actions abroad are currently taking place, my rationale was that it is logical to expect that encounters with child soldiers will increase in frequency and that, if it is to be the case, the CF, as an institution, has a foremost responsibility to prepare its troops to operate in combat environments where child soldiers constitute a daily reality and a tangible threat to both its members’ safety as well as to the security of the communities they were deployed to protect and stabilize in the first place. As of now, a cursory look at the map of countries where the use of underaged combatants is prevalent suffice to show that CF members and child soldiers already share the modern battlefield space on a daily basis. This situation confronts professional soldiers with the perpetual dilemma of having to perform military tasks primordial to the success of their mission while facing combatants that they cannot ethically confront the way they have been trained to. The generally received argument related to this statement is that international laws and western perceptions of children prevent our militaries facing underaged combatants on the battlefield from seeing them as foes they can conceivably retaliate against. Relevant to this, my argument is that the CF members are at this time not sufficiently provided with “tools” tailored to suit the specific needs and circumstances of combats involving child soldiers. Framing my thesis, I postulated that the development of such guidelines would be highly beneficial to the CF as an institution as well as to the troops and, by extension, although not the primary focus of my work, that the development of such practices and strategies specifically modeled to face child soldiers on the battlefield would serve the underaged combatants’ interests as well as Canada’s international image. Shifting from my research proposal to the historiography part of my project caused me to have many headache episodes. The more I would read on the reality of child soldiering, the more it became clear to me that the study of this phenomenon has traditionally focused almost exclusively on the underage combatants; the perspective of the professional soldiers who are likely to confront such combatants has been sorely neglected. A cursory examination of the existing literature on professional forces fighting child soldiers indicates that there seems to be a correlation between the presence of child soldiers on the battlefield and the increased difficulty for troops to conduct missions as well as a higher rate of negative psychological outcomes for western professional soldiers in the post-deployment phase. However, while historical records and analyses stating and reporting diminished combat effectiveness of professional troops when confronted to child soldiers on the battlefield are many, the study of psychological repercussions on individual soldiers appears to be scanty and incomplete. This is where my journey toward assessing the readiness of the CF to confront child soldiers became a lot more complicated than expected in the beginning. Answering this single question: “how does facing child soldiers on the battlefield affect our militaries?” became a growing focal point of my analysis. What started as a policy-making orientated thesis was taking a more and more insightful turn. How was I to fully grasp this reality? One foreseen difficulty I mentioned in the caveats and limitations part of my research project was the delicate nature of the topic to be discussed – confronting underaged combatants – and how I expected it to render fully expressing views and thoughts of professional soldiers about it strenuous. How was I to reach out to my subject? I am assuming you now know where I am going and have a better idea of why this blog entry is entitled The long story made short of a Master student’s journey to a would-be Infantry Officer. There is a famous saying that states that one has to walk the walk if one is to talk the talk. Therefore, after careful considerations and with this in mind, I decided to submit my candidacy for an Infantry Officer position within the CF. That decision was certainly not a straightforward one. I am an academic, a female, a mother of two, I come from “pacifist Quebec” as J.L. Granastein puts it…In short, that decision was unexpected and came as a surprise to many people. The odds were not so high that I was ever going to decide to follow that path. My joining the military as a result triggered a whole brand new set of questions and interrogations that would cross my mind as I would discuss it with (and also often found myself justifying it to) the people around me. That decision got me to think about research and ethnography, gender and leadership, “ethnicity” and militarism, the perception of the CF and its role in the Canadian society and so on. This entry is therefore to be read as the preamble to those many different topics I will get the chance to discuss in future blog posts. 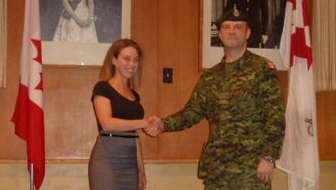 On Tuesday, March 8th 2011 Elise De Garie officially became a 2nd Lieutenant with the North Saskatchewan Regiment. Elise De Garie is a Master’s candidate at the University of Montreal and the French Editor for Canadian Military History online. Child soldiers, child combatants, and underaged combatants refer interchangeably to any individual under 18 years of age acting as armed militant in combats or being exploited in this context.